I am fortunate enough to live in Florida where we have an extensive shallow coral reef formations near the coasts. In fact, it is the only state in the US that has coral reef systems close to the coasts. Coral reefs are the building blocks for diverse ecosystem that provides shelter, food and breeding grounds for many of the fish in our oceans at one time of their lives or another. They are often called the rain forests of our oceans. Most of the sport fish we catch, start in these reef systems until they are large enough to venture out into the great blue deep. Spiny lobster, that I love, live and breed here. The more I dive in the reefs off Florida, the more I am intrigued about these incredibly diverse animals. The most gorgeous ones I have seen were off Key west, bright vivid and plenty of variety. Today, I just thought I would give a quick overview of the types of coral you may see while diving in these reefs close to the coasts in Florida. I will in future, feature different types in more detail. More than 45 species of stony corals and 37 species of octocorals are found along the Florida Reef Tract. This is commonly called The Florida Reef Tract (FRT) and it stretches 358 miles from the Dry Tortugas National Park located off of the Florida Keys to the St. Lucie Inlet in Martin County. Almost 2/3 of the Florida Reef Tract lies within the Florida Keys National Marine Sanctuary which is a marine protected area that surrounds the Florida Keys island chain. Florida’s coral reefs first came into existence between 5000-7000 years ago when sea levels rose following the last Ice Age. Reef growth is incredibly slow. An individual colony may grow 1/2 inch to 7 inches a year, depending on the species and the weather conditions. While many coral reefs will grow each year by the expansion of new polyps, they are constantly being ground into sand by storms and animals. They are also taking damage from boaters and even divers and snorkelers stepping on reefs. I will say that my last dive in Lauderdale by the sea, I thought the coral growth was superb compared to last summer and they coral looked to have more diversity and healthier overall. From what I know of local conditions, I would have to attribute this to the lack of tropical storms and hurricanes. 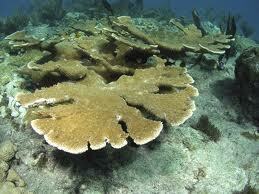 According to a letter from Center for Biological diversity, 56 of these coral will be extinct by 2100. Click here for full article. The elkhorn and staghorn coral are on the endangered list. But I digress. Coral can be classified into two main types, hard coral and soft coral. Hard corals are made of a rigid calcium carbonate (limestone) and appear to look like rocks. Often referred to as stony corals. Each polyp secretes a hard exoskeleton made up of calcium carbonate and a chalky internal skeleton that stays in place even after they die. As each generation of polyps dies and their exoskeleton remains, the coral grows a bit larger and because each polyp is so small, hard corals grow at a very very slow rate of 1/2″ to 7″ a year. 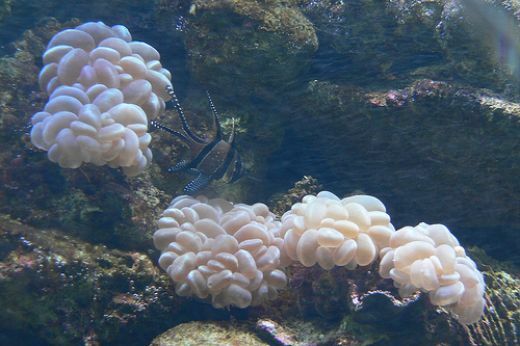 Hard corals are scientifically known as scleractinians. 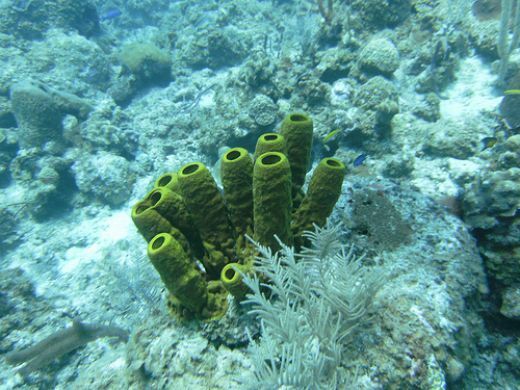 There are over 40 types found in Florida reefs. Soft corals are also composed of some rigid calcium carbonate, but it is blended with protein so it is less rigid than hard corals. These corals appear to be rooted to a surface but they lack an exoskeletons, they sway back and forth with the currents, appearing to be more like plants blowing in the breeze. 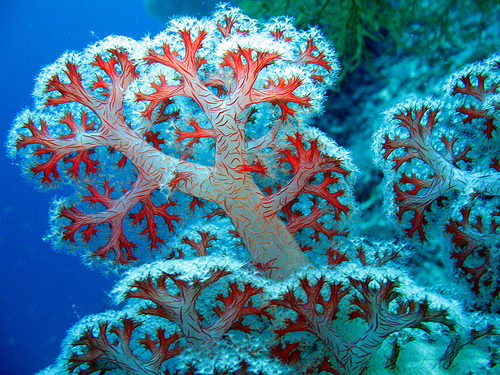 They are also called octocorals, some of which are also called gorgonians. These look like strange trees and shrubs, although they too are composed of living polyps. Unlike stony corals, octocorals are unable to build thick limestone skeletons, but are supported by an internal structure composed of a horn-like substance called gorgonin, hence the name. The most common in Florida are the majestic sea fans and sea whips. 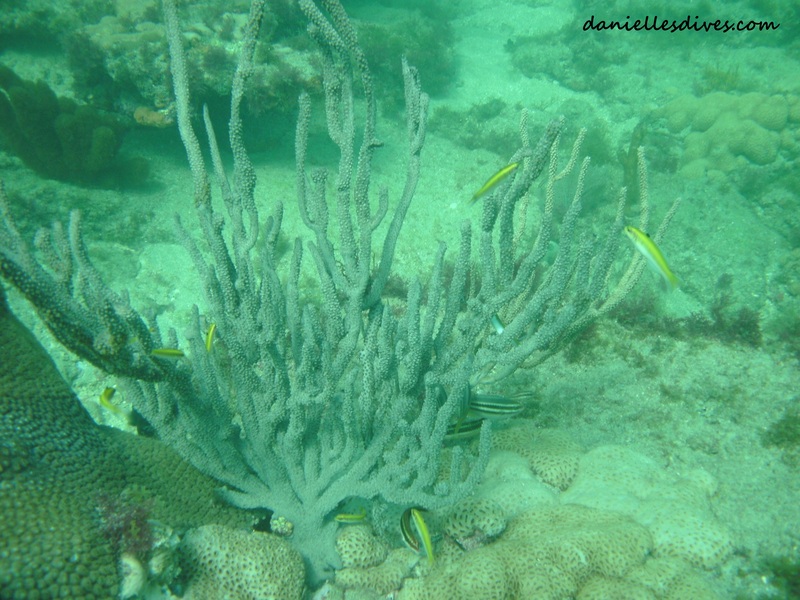 Branching Coral – Branching corals are characterized by having numerous branches, usually with secondary branches. 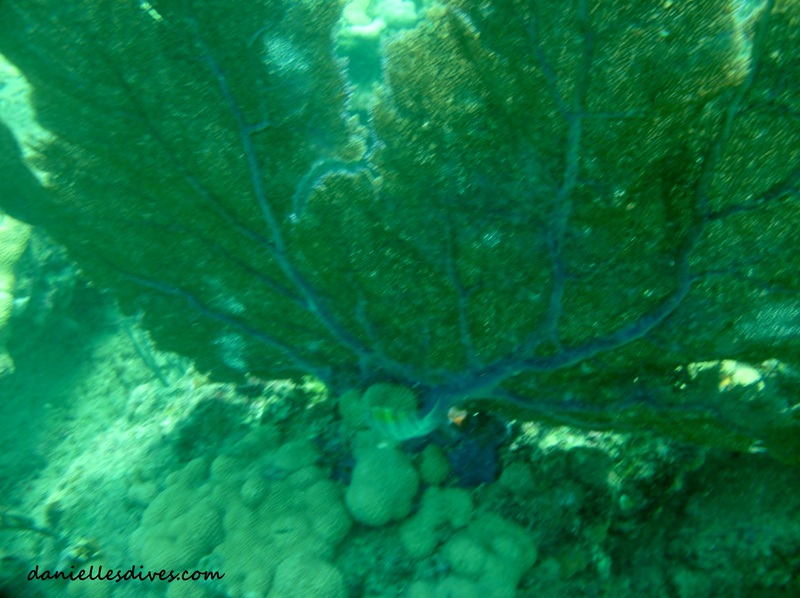 The staghorn featured below is a branching coral. Staghorn Coral – Staghorn coral is a branching coral with cylindrical branches ranging from a few centimeters to over 6.5 feet (2 m) in length.This coral exhibits the fastest growth of all known western Atlantic corals, with branches increasing in length by 4-8 inches (10-20 cm) per year and is one of the three most important Caribbean corals in terms of its contribution to reef growth and fish habitats. It is endangered in Florida and is suffering from coral bleaching. Two years ago these coral looked really bad in LBTS but over the last two years, I have seen improvement on the second and third reef fingers. We used to call it the bone yard because the broken pieces all amassed look ominously like a grave. 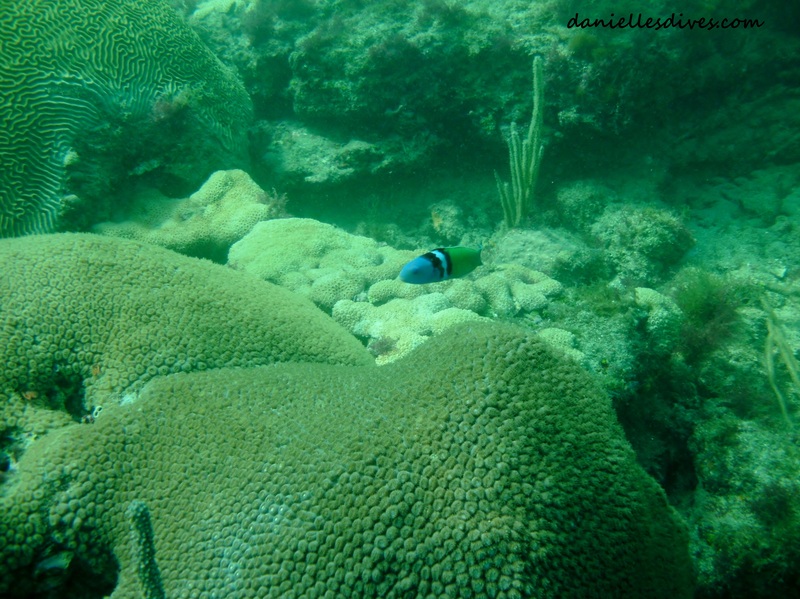 Elkhorn Coral – This coral is considered to be one of the most important reef-building corals in the Caribbean. This species of coral is structurally complex with many large branches. The coral structure closely resembles that of elk antlers. A popular choice as a home for lobsters, parrot-fish, snappers and other reef fish. Elkhorn coral colonies are incredibly fast growing with an average growth rate of 5 to 10 centimetres (2.0 to 3.9 in) per year and can eventually grow up to 3.7 metres (12 ft) in diameter. Foliase Corals – Also called cabbage coral. Corals with foliase or whorl-like growth patterns form beautiful structures that have been compared to the open petals of a flower. The coral’s folds and convolutions greatly increases its surface area, and the spaces in between the whorls may provide shelter for fish and invertebrates. Again, I thought this was a different creature. They have a plant like appeal to them. Digitate Coral – look like fingers or clumps of cigars and have no secondary branches. The Pillar coral below is one. Pillar Coral – This type of coral grows up from the sea floor, but without any secondary branching. They can grow to be up to 2.5 m (8 ft) tall. They can grow on both flat and sloping sea floors at a depth of between 1 and 20 m (65 ft). They are one of the few types of hard coral whose polyps can commonly be seen feeding during the day. Encrusting Corals – Encrusting corals are characterized by low spreading growth forms that usually adhere to hard rocky surfaces. Growing larger in diameter verses upward like many other forms of coral, encrusting species have a major advantage over their branched relatives. 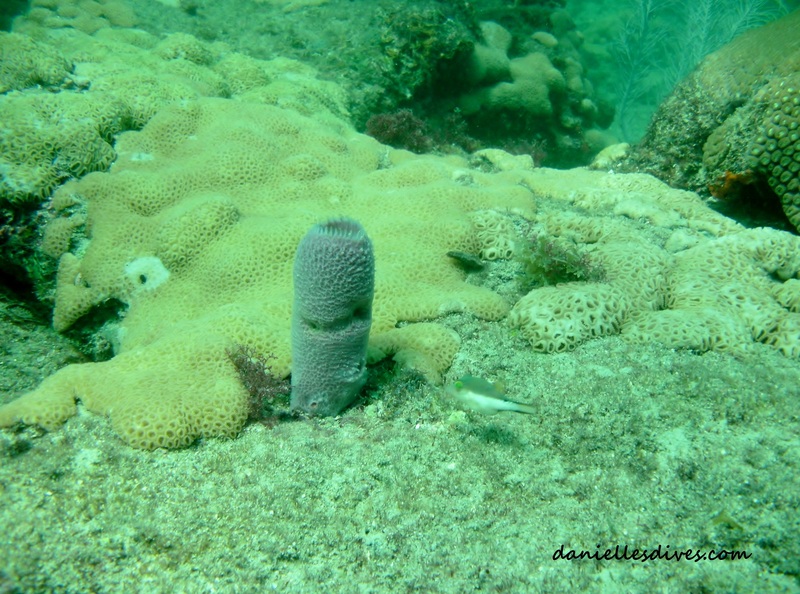 Branching corals are much more susceptible to breakage due to violent storm conditions. I find these covering old rocks and dead coral reef patches. Tube Coral – Tube Coral is a large polyp stony coral, and is found in a variety of colors and forms depending upon species. This is interesting to me as I thought these were large sponges. 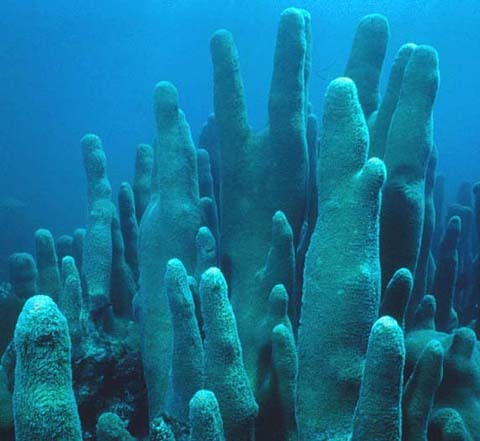 Massive Corals – Massive corals are characteristically ball- or boulder-shaped and relatively slow-growing. Because they have very stable profiles, massive corals are seldom damaged by strong wave action unless they are dislodged from their holdfasts. We have many types of these in Florida. These type of coral always make wonderful nurseries for juvie fish. See below for two types. Brain coral – Named because of this corals spheroid shape and grooved surface which resembles an animal brain. The life span of the largest brain corals is 900 years. Colonies can grow as large as 6 or more feet (1.8 m) high. Brain coral is being attacked by black-band disease. This is the only coral disease that can be successfully treated. Great Star Coral – This type of coral is a colonial stony coral found in the Florida & Caribbean seas. It forms into massive boulders and sometimes develops into plates. It’s Polyps are the size of a person’s thumb and can be seen fully extend at night. This is another type of massive corals. Table Coral – Table Coral is the same branching type of coral as finger coral like Staghorn coral, however it grow as flat plates. The shape of table coral is ideal to expose as much of their surface as possible to sunlight. The usual color of table coral is a dull brown or green, but it is brightened up by the numerous reef fish that shelter under and around its plates. Gorgonians – This family of soft coral is also called sea whips or sea fans. Individual tiny polyps form colonies that are normally erect, flattened, branching, and reminiscent of a fan. Others may be whiplike, bushy or even encrusting. A colony can be several feet high and across but only a few inches thick. They may be brightly colured, often purple, red, or yellow. I generally sea purple and red ones. Was fortunate to see a massive 5 one in LBTS on last trip. Gorgonians are found primarily in shallow waters, though some have been found at depths of several thousand feet. The size, shape, and appearance of the gorgonians depend on where you dive. The more fan-shaped and flexible gorgonians tend to populate shallower areas with strong currents, while the taller, thinner, and stiffer gorgonians can be found in deeper, calmer waters. Toadstool Coral – aka leather coral, Mushroom Leather Coral and Trough Coral. 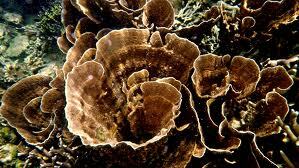 Generally found various shades of brown, with white or gold polyps. It is difficult to identify many species because they all have the similar appearance of a mushroom or toadstool, each with a distinct stalk and capitulum (cap). As they grow older, they develop a folded appearance. Tree Corals These flowery soft corals are commonly seen on many of our shores. They are usually attached to hard surfaces including boulders, jetty pilings and coral rubble. These soft corals look like bushes. The common tissue is generally rubbery but rough to the touch. A thick main trunk attaches to a hard surface on one end, with many small branches on the other end which is why they are referred to as Tree Coral. They come in many colors and usually will have different colored tips. Bubble Coral -I do not see these on my underwater adventures in Florida. Bubble corals have large water filled bubbles. It is found in the Pacific Ocean and parts of the Red Sea, bubble coral can be seen in varying species, colors and forms. They maintain their egg-like or rather grape like appearance during the sunlit hours, then deflate at dark, manifesting finger-tentacles that feed on plankton, etc. 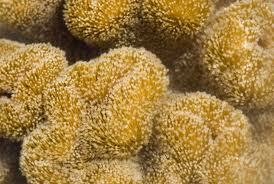 This type of coral is sometimes referred to as Grape or Pearl Coral and also as Bladder Coral. I have rarely seen these and have pointed them out to Rich. I thought they were eggs of some type. Sea Pens – I have not seen these in Florida. They were named after their feather-like appearance reminiscent of antique quill pens. 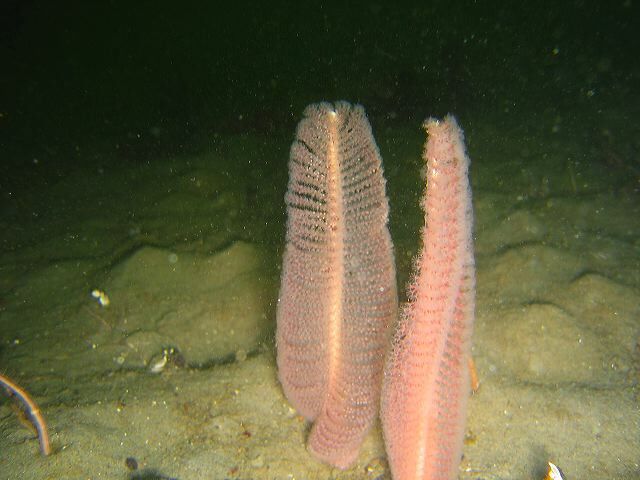 Sea pens may rise up to 2 metres (6.6 ft) in some species, such as the tall sea pen (Funiculina quadrangularis) and are sometimes brightly colored. Rarely found above depths of 10 metres (33 ft), sea pens prefer deeper waters where turbulence is less likely to uproot them. This entry was posted in Creature Feature, Great Pics and tagged black band disease, brain, coral reefs, diving reefs, elkhorn, florida reefs, folias coral, har coral types, maze, pillar coral, reefs in florida, sea fan, sea whip, soft coral types, staghorn, staghorn coral, tube coral, types of coral. Bookmark the permalink.